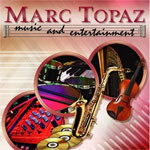 Marc Topaz Music and Entertainment, a full service music and entertainment company, is a highly acclaimed provider of impressive, versatile, exciting and authentic sounding Bands & Orchestras, polished and professional DJs & MCs, talented and creative Jazz Combos, and elegant and inspiring Classical Ensembles, delivering dazzling and unforgettable performances at many of the New York Tri-State area's most unforgettable jewish weddings for over twenty years. Our Bands and Orchestras, famous for filling dance floors with a wide variety of magnificently performed music in all musical styles, have been referred to as "the most impressive collections of musical talent to share a stage". These gifted musicians, in addition to performing together, have shared the stage with such noted artists as Aretha Franklin, Diana Ross, Christina Aguilera, Shakira, Bette Midler, Bobby McFerrin, Jon Bon Jovi, Julio Iglesias, John Popper, Jay Black, Carly Simon, Dizzy Gillespie, Gloria Gaynor, Idina Menzel, and many other famous entertainers and bands, as well as with leading symphony orchestras, and in popular Broadway shows such as Movin' Out, All Shook Up, Spamalot, Thoroughly Modern Millie, Swing, Dreamgirls and more. Should your needs include music for your Wedding Ceremony, the musicians of Marc Topaz Music and Entertainment will make the perfect musical statement. Each Band and Orchestra features talented musicians that perform beautiful ceremony music, and our Classical Ensembles offer unlimited musical possibilities. Our DJs and MCs create a party that is uniquely yours based on your requests and the needs of your guests. From your grand entrance to your cake cutting to your special dances with parents, our knowledgeable DJs will skillfully spin your favorite music as you and your guests make lifelong memories. The talented lighting designers of Marc Topaz Music and Entertainment can combine the strong points of conventional and intelligent lighting and more to set the ideal mood and ambiance, creating stunning visual beauty in any event setting. Plasma and projection screens are available for live camera feeds and pre-recorded video montages. We welcome you to schedule a complimentary consultation. Our experienced wedding experts will assist you in selecting the music and entertainment that will transform your vision into reality! Get more for your wedding! Don't forget to mention ChossonKallah.com when visiting Marc Topaz Music and Entertainment.